Today, Nov. 21, the United States Mint released a collectors set of 10 circulating-quality quarters honoring parks, monuments and historic sites in Iowa, the District of Columbia, Missouri, New Jersey and Indiana. CoinNews photo of 2017 America the Beautiful Quarters. The designs honor Effigy Mounds National Monument in Iowa, Frederick Douglas National Historic Site in the District of Columbia, Ozark National Scenic Riverways in Missouri, Ellis Island (Statue of Liberty National Monument) in New Jersey, and George Rogers Clark National Historical Park in Indiana. 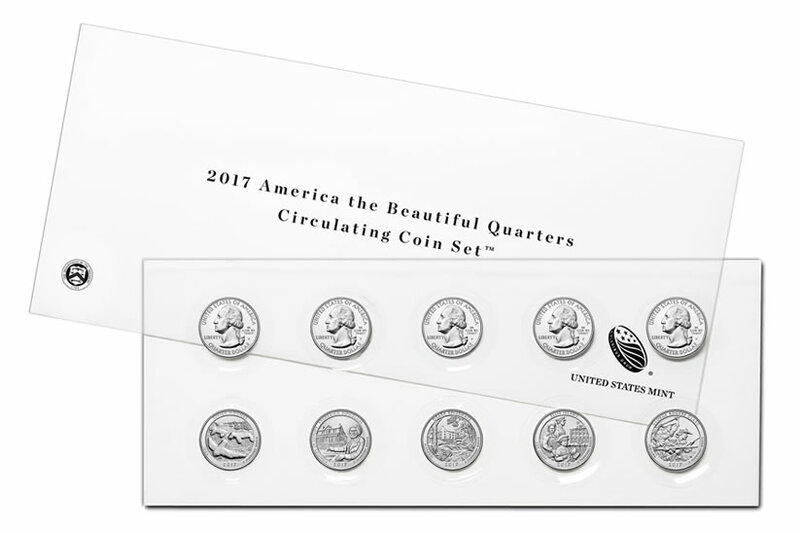 Dubbed the 2017 America the Beautiful Quarters Circulating Coin Set™, the collectible has 5 quarters from the Denver Mint and 5 quarters from the Philadelphia Mint — the same two facilities tasked with making U.S. coins for circulation. Iowa’s Effigy Mounds National Monument. DC’s Frederick Douglas National Historic Site. Missouri’s Ozark National Scenic Riverways. New Jersey’s Ellis Island (Statue of Liberty National Monument). Indiana’s George Rogers Clark National Historical Park. The U.S. Mint’s series of America the Beautiful Quarters® was introduced in 2010 with circulating coin sets released every year since then. They started at $9.95 apiece and moved down to $5.95 beginning in 2012. Their inexpensive price and easy-to-open packaging makes them attractive to collectors. The packaging protects its quarters while allowing them to be easily removed and placed in coin albums or other storage products. 20,294 for the 2016 set. 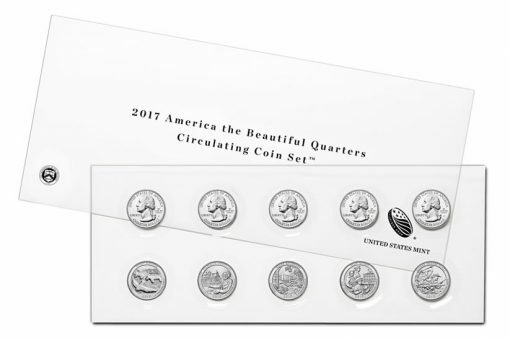 Order the new or past sets from U.S. Mint’s online page for quarter products, or call 1-800-USA-MINT (872-6468). There is no mintage or household ordering limits. The higher price “Uncirculated Quarters Set” is a different type of strike used just for collectors and the same as the Uncirculated Coin Set that has all the coins of that year. I think it is a sharper and stronger strike that is better than the strike they use for the quarters we use from the bank. The “Uncirculated Quarter Set” is released only by the US Mint for collectors. It use to be a “Satin” finish but they stopped that a few years back. The lower priced “Circulated Quarters Set” is done in a “business” strike the same strike as the quarters we use in every day commerce or pocket change. It is the same strike as the quarters we get from the bank. I think I got that kind of right or just about. If not I would want someone to correct me please or explain it better. joera – Thank You for your answer, maybe it’s me*, but i barely or not even sea the difference between the “Circulated Quarter Set” & the “UNC Quarter Set”, ?, Have you or anyone bought a “circulated quarter set” from our mint, not the ones we get in change or banks, but the set you sea in the picture above. I have to agree with you about the sharper strike from the ATB* Quarters i buy from our mint than the ones i get in change, but i never got one from the bank tho. You are welcome. I have ordered the Circulated Quarters Set from the mint. I think the quarters from the Circulated Quarter Set look better than the ones from the bank because the ones we get from the Mint do not have all the “bag marks” or dents and scratches from being in the bags and moved around during shipping and handling. When quarters from the Uncirculated Quarter Set get graded by a grading company you can get several MS70. When quarters from the Circulated Quarters Set get graded you will be lucky to get a MS68. Thanks for the great discussion about the differences on these coins. As joera said, the Mint struck all the coins in their annual uncirculated coins “Mint Sets” in a special satin finish – from 2005-2010 & those sets are a bargain at today’s prices IMHO since you might get lucky and get some MS-70 (or SP-70) coins from the grading services. The overall quality of the annual uncirculated coins “Mint Sets” has gone down since they stopped the satin finish “experiment” at the end of 2010.